How to Install a Propane Heater Step By Step? Propane heater is an excellent way to add low cost heat to your rooms, houses and offices. Wall mounted vent free heaters are also safe to use and carry lost cost than electric heaters. Also, these heaters heat more than 1,000 square feet so you can always add them when you got to cut short your electricity bills. Propane heater burns cleans and safe. As there are no harmful fumes produced by propane heaters, they perform excellently. These propane heaters look beautiful as well as they are functional. You can see blue flames burning behind the glass which almost looks like heating with wall art. Would you like installing a propane heater as the installation process is quite simple? Other than that, some propane heaters even work without using an electric ignition in power outage, isn’t it great? Here are the steps to install one at your place either your house or office. Installation doesn’t need professional tools but just a little of your efforts and a few tools. You need to choose the location where you will hang the propane heater. Make sure to choose an area on the outside wall of your house in order to avoid any accidents. The propane tank is placed outside the home along with the heater directly on its other side. Once you are done with determining the location, it’s the time to remove the heater from the box with proper care. Choosing the location on an outside wall is suggested. Now determine the height at which you want the propane heat to stand at. Make a mark on the spot where you need to hang the heater inside and before hanging, ensure that all the pieces are ready there. Also, check if there are any hindrances or obstacles to create a problem in the installation. If there are, remove the obstructions. Now is the time to use your drill and a drill bit to fit the screws provided with the propane heater. This step is extremely important as you need to hang the heater on the wall using the screws. For that, remove the hardware from the plastic wrap and take it to hold on the wall. Next, take the screws and insert them to secure the hardware. On the brackets, put the heater on and see where you want to hang it. Once decided, it’s the time to make a hole for the propane hose so that it can easily exit through the wall directly to the place where the propane tank is placed. Keep the heater aside to do the installation process as you cannot install it with the heater on. Take the hole producing drill bit to drill a hole in the marked area on the wall. Once you are done with the drilling, you need to put the heater back on the brackets. Don’t forget to check if the heater is hanged securely and at right level. In the hose hole, insert the hose carefully and connect the heater to the propane tank outside. As this is the final step for the interior installation, you have to act very careful because once the heater is hanged, it will be hard to do any further changes. Make sure to slide the hose properly so that it reaches the tank without any issues. Now you need to connect the hose to the tank coming out from the hose hole. You might need an adapter for that. To make sure everything goes right, leave the propane tank off and make the connection right and secure. Once when you are done with all the connections, turn on the tank to see if it is working fine. For that, push the heater knob down and switch on the igniting button several times. You will see a flame and when the flame begins, release the knob and choose the desired heat setting to enjoy the desired warmth. Keeping the heat on an average temperature will help you save money by cutting down the energy bills. 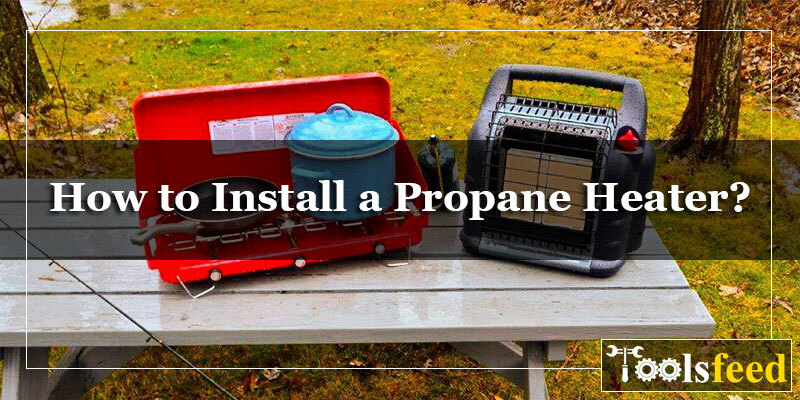 Note: To connect to the propane tank, go outdoors and using the adapter provided along, make the connection with the heater. If your heater doesn’t have any adapter, you can buy it separately from any hardware store. As the adapter is an essential accessory, you cannot install the propane heater without this. As you may know, heating is the most popular use of propane gas whether it is in residential heaters or commercial. Since both types of heaters have central heating furnaces, the installation should be done carefully to avoid any sort of accidents or mis happenings. Taking care of the safety and comfort holds utmost importance because heating appliances are not always a fortune to deal with. Incorrect use can lead to fire or bodily harm so make sure to follow the guidelines provided with the installation manual. How to Make a Workbench Top on a Budget?